During the final week of the 1994 spring training season, I won a radio contest on The Ron & Ron Show. The prize was a round trip flight to Cincinnati, Ohio to see the opening game of the 1994 baseball season between the St. Louis Cardinals vs. Cincinnati Reds. The cool thing about seeing the Cardinals play was that I had just seen them 2 days prior in a spring training game, so as I was collecting autographs, I was telling them that I would be in Cincinnati to see them again. Ironically, the hotel I was staying in was directly across the street from where the Cardinals were staying. It was great wandering around and having Cardinals players recognizing me and congratulating me on winning the radio contest. Tom Urbani, a pitcher for the Cardinals, offered me his complimentary tickets in case the tickets I won weren't good enough. I ended up taking him up on his offer as the seats I had were in centerfield, his were behind home plate. I wasn't planning on getting any autographs, but there were still some players I had never gotten. The hotel had a gift shop and were selling Cardinals team sets, so I bought one along with a new Sharpie. I met Jose in the lobby of the hotel. 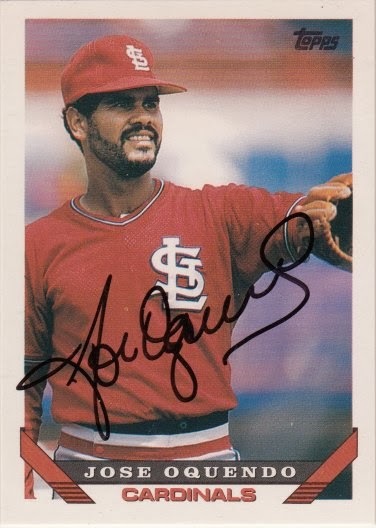 Jose signed a 1993 Topps card #535.